Yes, It is unfinished, and thank you. i have had computer problems off and on now for a while (thanks to Windows 10). Also, this is a screenshot within CAW, so the texturing will appear blurred until you scroll close to it. This may not be the latest copy of this world I have worked on...I have worked on that project for quite some time, but I may have a fresher copy on my laptop--some of the objects are missing from this version. I have yet to put roads and homes. I was going to attempt this project in Bryce or another similar program. Slepalex going to try your terrain suggestions this weekend on my laptop with the unpaint brush - maybe it won't give me such a rough time in the TE as my desktop. This is true.. I for one have certainly not mastered Bryce nor it's TE and love the fact that Bryce allows you to import your own height maps and pgm files. So far I have learned a lot from this thread and thanks to those posting with their skills and knowledge. My goal is to work on getting an older computer set up so I can run Bryce better; right now, it is giving me headaches.. I think because it is a 32 bit application. Once I close out, I also get a referenced memory error that never happened in the past as well as crashing whenever my project gets a little hefty - sometimes just with one terrain. I have resorted to importing low poly objects and saving often due to the crashes. Rasberri - if your computer running Bryce has memory issues and the computer has at least 4 GB of memory, you can make Bryce large address aware and get instead of 2 GB around 3.5 GB, which is an improvement. The tool is tiny and free. I have a video (link) on my website that explains it all. 3D CG Documents > Videos > Horo > 19. Bryce Memory Shortage – and what you can do about it. I had such a computer. 4 GB is not enough to make sense to use LAA. You need a minimum of 6 GB. Slepalex - yes, it depends on how much the operating system uses. If it takes 2 GB, then you need at least 6 GB. Win 7 uses 1.5 GB minimum, Win 2000 less than 1 GB. Thanks Horo & Slepalex .. I will try that with the memory address thing. I have never been able to figure it out, but it only shows up when I have been running Bryce or some of my older 32bt programs. My computer has a 6 core CPU with 16 gigs of RAM. Bryce is running off of a solid state drive as well. I am a little short on memory with my GPU and plan to upgrade.. it is a GTX 960 with only 2 gb. My laptop is running the same specs except with a 4 core CPU. I think what was said earlier about Windows 10 makes sense. Windows 10 is a memory hog and everytime it updates it breaks something or makes a mess of something. The GPU does not participate in the rendering in relation to Bryce. Rasberri - I'm' glad that you found the Symmetrical Lattice is located on Bryce's Create Menu Bar (see picture). In Edit Mode, it has the same layout as the Terrain Editor but reproduces the same effect on both sides, unlike the terrain which tends to be flat on one side. I also have a lot to learn. Four Terraces, Smoothed Slopes, Out - Hard Fluvial, High Sedimentation - Invers. All default settings. Do you have Gamma Correction enabled. I switch it off as it seems to give images a grey /misty appearence. StuartB - Yes, I actually do have Gamma Correction on. I had no idea that's what it did. Thanks. Slepalex - What do you mean by rating it from the view of the camera after the render? I'm going to attempt on creating a terrain in Bryce first and importing it in GeoControl Demo and go back to Bryce. Wish me luck. Eugenius, in general, this phrase is superfluous. It's all Google Translate. I mean, what I'm doing is just rendering. From the view of the camera, but not from the directors view. Slepalex - Thanks for the explanation. After creating a terrain in Bryce and imported it in GeoControl Demo, I then generated mountain ridges which followed the height path of the original terrain. After importing back in Bryce, I added a texture and then Height Noise in the TE. Here you go! You have already understood the basic principle of work. Now you need to learn how to create predefined landscapes in Bryce with brushes manually, of course, using all the TE tools. And then do all sorts of operations in GeoControl. TE tools are not enough to create realistic landscapes. This terrain experiment isn't necessarily all done with brushes. The original terrain was Bryce generated, however, I did paint the Rolling Hills afterward before importing it in GeoControl and back into Bryce. I'm going to do some sketching and also create a GeoControl cheat-sheet as some of the terrain names don't always match their descriptions. Eugenius - nice work on the terrain. Are you aware that you can draw with Isolines in GeoControl? Eugenius - GeoControl and WorldCreator both have Isolines. It needs a bit of experimenting to get the hang of them but it's a very powerful option. You can either create a blank canvas or modify an existing terrain that was generated in GC or WC. It doesn't work on imported terrains like the Filters do. Horo thanks for sharing, I haven't been able to master the ISO lines.. attempted to create rivers and valleys with them, but I agree very powerful. Rasberri - GeoControl demo version has these little boxes throughout the software (see picture/red boxed) which links to the Help Menu. Each one explaining the various terrains or filters in detail; I copied and pasted them on WordPad. I haven't edited the document but I can send it to you via private email if you'd like. Or you can download the demo version if you prefer. I've been also playing around with the software but started to take notes of what works and what doesn't. Eugenius Maximus, You are doing well! The only advice. After importing to Bryce, reduce the height of the landscape by Y twice. It will be realistic. Bryce makes a height map based on 8 bits of gray. After re-export from GeoControl as a PGM elevation map becomes 16 bits of gray, so the height of the mountains becomes twice as large. It is necessary to return the original height for credibility. It's easier to do this: click on the initial version of the Alt + C landscape (copy matrix), after importing from GeoControl click on the new version Alt + V (insert matrix). An upgraded version of the landscape will take the same size and position in space. The only advice. After importing to Bryce, reduce the height of the landscape by Y twice. It will be realistic. Bryce makes a height map based on 8 bits of gray. After re-export from GeoControl as a PGM elevation map becomes 16 bits of gray, so the height of the mountains becomes twice as large. It is necessary to return the original height for credibility. It's easier to do this: click on the initial version of the landscape Alt + C (copy matrix), after importing from GeoControl click on the new version Alt + V (insert matrix). An upgraded version of the landscape will take the same size and position in space. Slepalex - Thanks for your advice; I copied and pasted it in my notes so that I won't forget next time :-) I'll do so on my next terrain experiments and let you know how it goes. Eugenius - default area to height ratio in Bryce is 4:1 (81.92:20.48). This is often too much but sometimes not enough. The character of the terrain changes dramatically if this ratio is altered. A few weeks ago, I mentioned a method of instancing trees or other objects onto a terrain and having the instancing lab not putting the object where there is water. 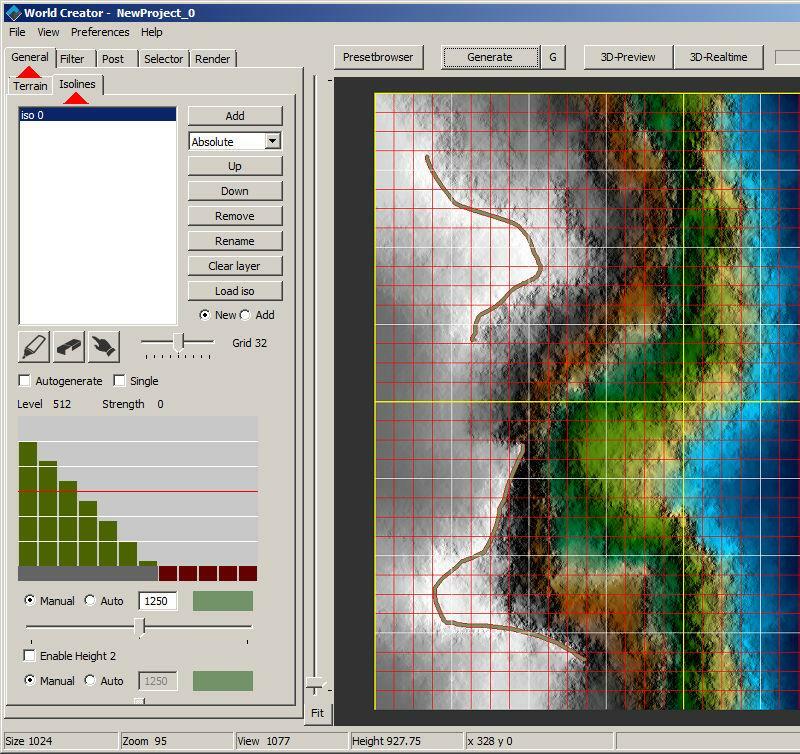 This method involved using the red lower bracket in the Terrain Editor to effectively switch off the terrain where the water would eventually cover. If you do that, the Instancing Lab will not put any objects where there is no terrain to land them on to. At the time, it was mentioned this same method could also be used for restricting the height that trees go to in a landscape. Today I tried it that way and it does work but there is something extra to note. Usually when creating a terrain in the TE, you would set the terrain to 'Solid'... If you are going to use the yellow high bracket to restrict the Instancing lab from adding objects to the high regions, you will need to turn 'Solid' off while you do the Instancing Lab part (you can make it solid once again after you've done in the IL). Oh, Dave! And I think why I didn’t manage to exclude the top of the mountain from planting trees!? It turns out that the whole thing in "solid". I cut the terrain with both brackets. Thank! Now I will know. We live a century - we learn a century.